A great project for teachers to make for their younger students is a scrapbook highlighting the school year. The kids can even get involved in the project. This is a guide about making scrapbooks for your students. I am an educational assistant for a kindergarten class. The teacher makes a scrapbook of the school year for each student. Photographs of the children are taken weekly; plus we have "famous quotes" sheets we fill out when a child says something comical and worth putting in the scrapbook. hanging file folders: For each student; a plastic bag is stapled on the inside of the file folder to hold photographs. A master file of scrapbook pages is kept in a 1 inch binder - each master file is placed in a sheet protector and "master copy" is written on the back of the copy to protect the master copy from being used. A collection of colored paper for making scrapbook pages is filed in the hanging folders. Files are labeled according to event such as "first day of school, field trip to zoo, harvest party, kindergarten graduation, recess, naptime, etc." 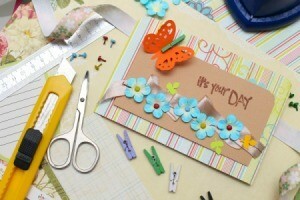 Copies of scrapbook pages are made in quantity and filed for use during the year. As the photographs are developed, a scrapbook page for each student is pulled for that event; pictures are cropped and glued onto the scrapbook page, a caption is made and it is placed in a sheet protector and filed in the student's file. Extra photographs - we make double prints - are stored in a sheet protector labeled "extra pictures". This sheet protector is filed at the end of the scrapbook. I made a memory page collage for each child this year; I cropped pictures and randomly placed them on a page with some extra pictures; it is a good feature and it uses up some of the extra pictures that were cropped, but still had photos that could be used in the scrapbooks. A large colorful label with the student's name, teacher & assistant's name, school, and school year is placed on the front of the 1 inch binder. The kindergarten diploma is placed in the back of the scrapbook along with the "extra photos". The books are presented to the parents at the kindergarten graduation reception the last day of school. I also wrote a poem entitled "twas the night before kindergarten graduation" that is enclosed in the scrapbook for the students. I use a Ellison die cut machine for embellishing scrapbook pages, plus stickers and other craft items. I always include a school calendar, daily kindergarten schedule and a list of the students in the scrapbook. The parents really appreciate the book and the child has a memory book with dates, names of students, etc. To enjoy for years to come. I would love to see your poem the night before kindergarten. I'm a parent doing 20 scrapbooks and need ideas!!! Can you provide the twas the night before kind graudation - love to read.